Commuting around London is not the easiest but a large proportion of those using public transport in the capital now say they are willing to put their hands in their pockets for better infrastructure. This has been highlighted by AECOM in its Future of Infrastructure research which harnessed data and opinions from over 10,000 people in 10 global cities on city infrastructure and ambitions for its future evolution. The engineering consultants found that sustainability, digital resilience and transport connections were three of the big infrastructure issues for over 1,000 Londoners - aligning with the mayor’s ambitions for a greener, smarter city. Three in five commuters are said to find it increasingly stressful to travel on public transport in London with more than half (57%) believing the private sector should be more involved in infrastructure development, according to the survey results. More worryingly, despite nearly three-quarters (70%) of those surveyed using public transport as their primary method of travel, almost a quarter (23%) struggle to get to where they need to go on time (rating the reliability of public transport as poor/very poor). This stark warning is most certainly the reason for why Londoners are prepared to part with their cash as 39% of respondents said they would be willing to pay higher taxes to help fund infrastructure improvements. However, this did not stretch to higher fares with only 25% willing to pay more fares for better public transportation moving forward. AECOM is now calling on government to move major projects outside the political cycle and create the right business environment to attract private investment and get key schemes off the ground. Colin Wood, chief executive for Civil Infrastructure, Europe, Middle East and Africa, AECOM, believes the findings show commuters in the capital care about infrastructure but poor engagement from providers, owners and wider industry has the potential to change the mood. The lack of confidence that the public has in politics delivering on infrastructure is no better underlined than by recent controversies surrounding some projects such as the Garden Bridge. AECOM’s survey results revealed that fewer than one in three Londoners feel that those in power are making the right decisions about what infrastructure projects to fund, and more than half (52%) believe that city officials take a short-term view of infrastructure planning. 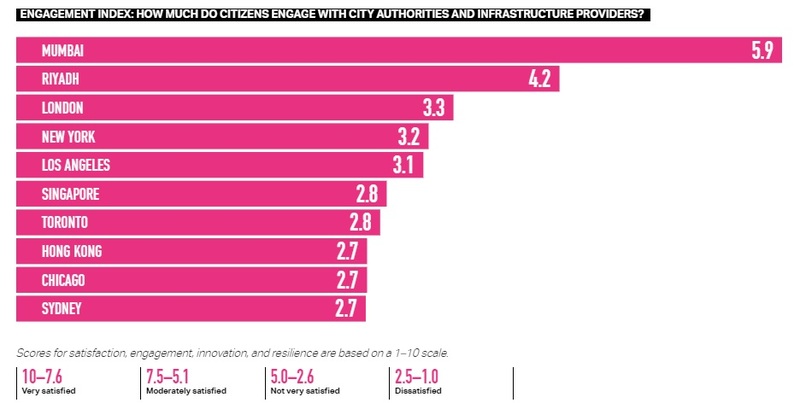 Of the 10 major cities surveyed, London ranked third to Hong Kong and Singapore, in terms of citizens’ satisfaction with infrastructure.